I watch a lot of cooking shows and I have always thought it neat to use and have a Butane Torch Lighter. I was excited to try this deluxe butane power torch with built in ignition system from FOGO. I can use it for so many things not just in the kitchen. It could be used to make jewelry, crystallize sugar on a dessert, solder and even to light cigars. It comes with a removable stand. The neck is angled 45 degrees and it produces a reliable torch flame and once ignited, you can use the flame lock to keep the flame lit hands-free. The flame temperature can reach up to 1300 degrees so be careful when using it. I find it very easy to use and has a large butane tank. It is easy to refill with standard butane. I know this will be a product that Rex and I will both use over and over. 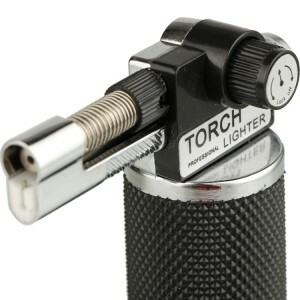 If you would like to purchase your own Butane Torch Lighter from FOGO you can do so on the link below from Amazon.com.